Discussion in 'Misc. TV Series' started by Union Jack, Mar 30, 2006. 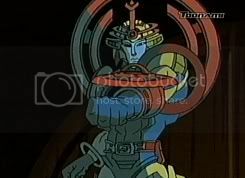 Does anyone know when or if the more recent he-man and the masters of the universe will be coming onto DVD?? It was a cracking cartoon..up there with JLU and the newer ninja turtles cartoon. I'm bumping this cause I want to know too. It's BS that Transformers stuck around to become craptacular while this was cancelled. This show was even more awesome than the original imo. A very difficult feat considering nostalgia's sake. The new Masters of the Universe series was pretty good actually. Well it wasn't perfect, but I felt it was an improvement over the original series. We get a better and more fleshed out origin for Skeletor. Cringer does NOT talk. Some high quality animation. I'd like to see this on DVD a lot more than the original. Also, what about the series from the late 80's early 90's? Anyone remember that one. I think it was called the new adventures of He-Man. Woah. Just looked it up. Suprised I missed that one. Doooesn't look too good though. Yeah this show was pretty good. cos cartoon network are a set of idiots..no more justice league,no more he-man.."i know let put loads of japanese crap on..its cheap and the gullible idiots out there will lap it up!" Well season 2 it was the snake people, not just Skeletor. Yeah, I would love to see a DVD for this series. I loved it. They were about to bring in Hordac and then boom, canceled. Total bull**t man. No, this show was the [email protected]%! It was freaking awesome and caused me to sit up straight and recognize CN for the first time, even though i'd always been a cartoon fan. I love the original but THIS version was 4 STAR animation! This was, and it's only my opinion, one of the top three best animated shows in terms of storyboard animation, period. For all time. It's a damn shame that it only lasted a season and a half! Those @$$wipes at Cartoon Network don't know sh#%$ when it comes to programming what viewers want to see!! Um every show does the same thing every episode. It had great animation, but the writing reminded me too much of the original, and that show was from the eighties, before Batman TAS or Superman TAS or Justice League. Too preachy, to the point of keeping the morality speech in the end of the episodes. There wasn't a morality speach at the end of every episode. At least, not to my recolection. Anyway, the show was pretty good. Skelitor was actually a pretty well written villain, and the characters had a bit more depth. Also, Prince Adam actually looked different from He-Man, so that was a plus. Also, Prince Adam actually looked different from He-Man, so that was a plus. Oh yeah. It was even worse than the Superman+Glasses=Clark Kent thing. It was He-man+Shirt=Adam. I know. I mean, with Superman, you can make the arguement that the glasses are an aspect of how he presents himself in both settings to make himself seem different in each (even though that doesn't explain how a reporter like Perry wouldn't figure it out). With He-Man? Taking off your shirt is not a good secret identity. What got me was when He-man showed up they'd be all like "Where did princed Adam go?!" and even as a kid I was just staring at them like "...are you f**king ******ed? " I mean god forbid someone walks in on the guy taking a shower. His cover would be blown. Exactly. The new series handeled it much better, I thought. It could still be a tad hoaky at times, but I thought overall it was a bit more serious. I loved what they did with Zodiac in that show. He already had a cool look, but they took it one step further. Which one was Zodiac? I can't recall. Oh yeah. The wizard dude. He was cool. Liked what they did with Sy-Klone too. I liked robato. 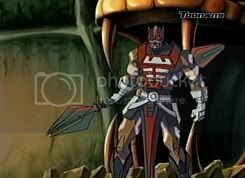 Oh how I wish the show stayed on we were about to see hordak and im sure there would have been a cool fight between him and skelitor.